In business, there is always a new set of challenges. As technologies rapidly transform our world, customers’ needs change. Often, organizations struggle through transformations, failing to identify problems and lacking the resources to solve them. Consequently, once-thriving businesses fade as customers seek other products and services that meet their needs. For companies seeking excellence, design thinking methodology offers synergy between business strategy and products. It finds innovative solutions to problems in a way that puts the customers’ needs first. While design thinking is often used at the product level, it can be applied to all levels of an organization. 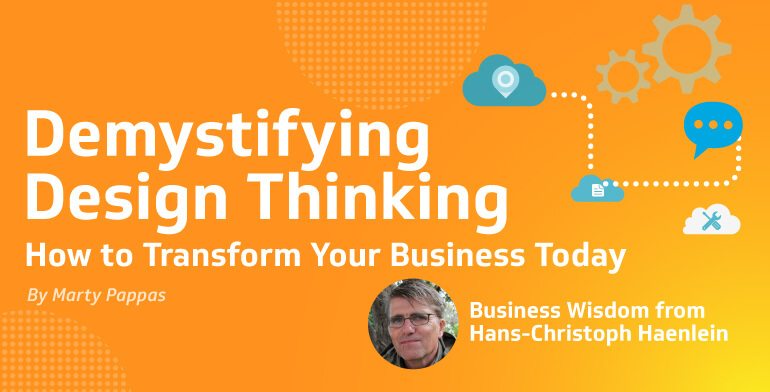 To demystify design thinking, I sat down with business strategist and design thinking evangelist Hans-Christoph Haenlein. Haenlein has a proven track record of transforming organizations using design thinking methodologies to uncover business opportunities across a large variety of industries. Hans, what is design thinking? Though design thinking has existed since the ‘60s, there is still some mystery out there about the concept. Simply put, design thinking is a rich set of tools and techniques that come from the world of design. Optimism is the embrace of possibility–the idea that even if we don’t know the answer, that it’s out there and we can find it. That’s what design thinking is about. And that is essential for innovation. It seems every company, no matter the industry, must innovate to survive. Absolutely. Businesses are mostly optimized around problem-solving, not so much around problem or opportunity identification. In these fast-moving days of digital transformation, business strategy is more often about imagining a different future for a business than it is about controlling and optimizing what happens today. Businesses are now increasingly confronted by what Horst Rittel calls “wicked problems” that are “open to multiple interpretations, with many potential solutions and none of them probably correct.” The days of defining future business strategy solely based on an analysis of past data have come to an end. Today, companies are focusing on customer needs to drive business strategy. Even better, organizations are recognizing the value of gathering and analyzing customer insights during a product’s infancy to save time and money. How do you use design thinking to understand what your customers want? Design thinking is human-centered, placing the understanding of what is desirable, what people want (even if they can’t articulate it directly) at the front and center of the process. It deals with stories and user experiences. The process begins by asking questions, talking to customers in depth to understand their experiences, yielding rich qualitative data. These observations are then clustered and abstracted into themes to yield powerful and often hidden-in-plain-sight insights that inspire fresh ideas and lead to action. This “naïve” mindset, asking questions and using empathy to understand customers’ viewpoints and experiences, makes design thinking very good at exploring ambiguous problem areas. It also helps foster an inspired team who are grounded in discovery and insight. You mention that design thinking fosters inspiration for teams. What are some other ways design thinking empowers teams? Design thinking is a team sport, with a rich set of tools and processes that support productive teamwork and collaborative work sessions with stakeholders. For instance, the use of flexible project spaces and written “tangible” information encourages an externalization of thought—a democracy of ideas—that catalyzes innovation and provides a shared team narrative. Foam-core boards or large, plain lightweight boards provide shared “thinking spaces” that can be quickly moved around and stacked. Sticky notes invite participation through ease-of-use, simple repositionability and ready disposability. Being able to color code topics and themes becomes a powerful modeling and thinking tool. This methodology is undoubtedly a catalyst tool for collaboration. Can non-design teams also use this approach? Design thinking is discipline agnostic, providing a collaboration and innovation platform across specialties and businesses. It provides a way for groups like engineering, design, marketing, public relations, HR, shipping and receiving to be heard. Most of all, it enables organizations to discover better futures together. This process also works at different scales, from facilitating collaborative work sessions to enabling cross-disciplinary teams to work together on focused week-long sprints or month-long projects constructively. It additionally has the advantage of being open sourced and easy to grasp. Often, teams already have existing methodologies in place. Can design thinking blend effectively with other popular work environments? Design thinking methods are very compatible with Agile Software Development, the Google Sprint methodology and the Lean Startup methodology. Design thinking can inject rich and well-grounded customer stories into all these methodologies and build on the same human-centered, collaborative and rapid-idea-iteration muscles that they all share. In a sense, Agile is the application of design thinking to software development, Lean Startup is its application to the building of new businesses and Google Sprint is its condensation into a week-long design effort. What does design thinking look like when applied effectively by organizations? When practiced well, design thinking is attentive to language and tone. We discover surprising stories through the use of open questions and therapeutic attention to motivation and emotion. We stimulate novel ideas with the phrasing of design challenges by asking open questions. Beyond language, we invite participation through the externalization of thought and process (Post-It notes and foam-core boards), and we elicit honest feedback through the use of low-fidelity prototypes that invite suggestions for improvement rather than judgment. So, you’ve decided to give design thinking a try. How do you get started? The first step for most initiatives seems to be earning the buy-in of your internal stakeholders. Spend time identifying the internal champions who will join you on your design thinking journey. Who are the right people positioned to champion innovation and design thinking? The most successful companies immersed in design thinking methodologies have backing by their CEO and senior leadership. The stronger the design foundation, the greater the innovation. Moreover, ensure that your management team understands the mindset and supports a culture of innovation. You have identified the right senior managers and stakeholders that will encourage design thinking. However, buy-in doesn’t stop there. Design thinking methodology requires an audience prepared to transform their product development process. Workshops and trainings are a great kick starter to initiate this process, but a culture shift is where businesses should make a long-term investment. Organizations should begin implementing a design thinking mindset wherever possible–whether a project, process, strategy or role. For example, if a team is overseeing a new product implementation, imagine how your organization can effectively anticipate concerns, test approaches or collect user insight. You are ready to implement design thinking. You have the people and tools in place, and you are ready to innovate! Try completing a Design Sprint on your next project. A Design Sprint is a five-day process for answering critical business questions through design, prototyping and testing ideas with users. For a handy step-by-step guide on executing a Design Sprint, click here or watch this video. When performed successfully, a Design Sprint generates consensus and vision alignment across all stakeholders–which makes driving innovation and results so much easier, right? For details on how we can help you implement a design thinking business strategy, please click the link below to learn more.